The next article in a series discussing fire sprinkler system inspection testing and maintenance is published in ASSE Fireline. 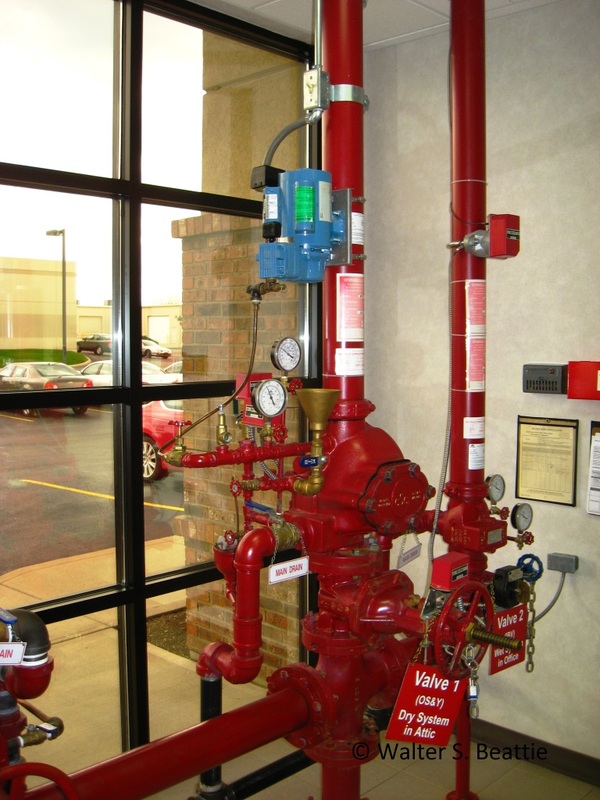 Inspection, testing and maintenance of dry pipe valves and dry pipe systems are critical to maintaining effective fire protection. Dry pipe valves are used in areas subject to freezing temperatures. This article focuses on Chapter 13, Valves, Valve Components and Trim, and assumes that all items discussed in previous articles regarding valve inspection and testing, records plans and calculations and impairments to the fire system have been completed. This article discusses items that apply specifically to dry pipe valves. A dry pipe sprinkler valve is a special valve that prevents the pressurized water in the fire mains from entering the sprinkler system piping. Normally, this is accomplished by filling the system with air. Most valves use a differential method of keeping the valve shut, and generally, the differential is 5:1 or 6:1. This means that 5 or 6 psi of water pressure is held back by 1 psi of air pressure. In the event of a fire in which a sprinkler head actuates, the air pressure in the system decreases until the valve trips. The trip pressure in a 5:1 dry pipe valve at 60 psi of water pressure is 12 psi. As the air pressure dips below 12 psi, the valve will trip, allowing water to enter the sprinkler piping and eventually exit through the open sprinkler head. A safety factor, usually about 20 to 25 psi, is maintained above the trip pressure to help prevent false trips. An air compressor, or other means of maintaining pressure in the system, is arranged to automatically maintain adequate air pressure. Components of dry pipe valves are discussed, described, and explained. Testing procedures for properly tripping a dry valve is outlined, as well as an explanation of how to reset typical differential dry valves. This entry was posted on Saturday, April 14th, 2012 at 11:25 pm and is filed under Uncategorized. You can follow any responses to this entry through the RSS 2.0 feed. You can leave a response, or trackback from your own site.